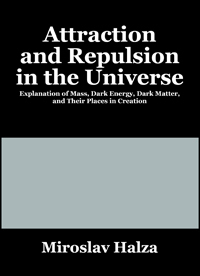 This book hypothesizes the existence of a trinity of subatomic “Builder particles” that manage the growth and expansion of the post-Creation universe via three elemental long-range forces. Gravitons mediate the relatively weak gravitational force, which draws objects together; photons mediate its opposite, the photational force that pushes objects apart; and magnetons (along with their parent particles, neutrinos) mediate the powerful inductive attractive force. Drawing on recent discoveries in the fields of astronomy, astrophysics, and particle physics, Halza carefully combines classic mechanics with its quantum counterpart to draw conclusions about underpinnings of our Universe that are both Biblically acceptable and scientifically plausible. Extrapolating from undisputed physical law and counterintuitive subatomic interactions alike, he goes on to explain why the inductive force obviates the need for the hypothetic “dark matter” that some cosmologists add to their theories of the universe in order to balance their equations—based on the misconception that gravity acts as the only long-range attractive force in our universe. One of the ramifications of Halza’s theory is that the observable matter in the universe may, in fact, be all there is—and that it exerts an attractive force six times stronger than previous theories allow for, given the inductive force’s presence. Among other things, this suggests that our Sun contains only one-sixth of its previously calculated mass—which has startling implications regarding the Sun’s age and expected lifetime, and the fate of all life on Earth. MIROSLAV HALZA specializes in uniting Holy Scripture with modern science. His first book, The Chronology of Revelation, explained the concept of time for both the visible and invisible worlds, based on elementary particles defined by quantum physics. In Church, Bride, and Wife, he presents these same particles as carriers for other forces shaping the universe, explaining the hypothetical concept of “dark energy."